Point Pleasant senior Kelsie Byus, seated front and center, signed a letter of intent to play softball with West Virginia State University on Thursday, Nov. 16, at the PPJSHS library. Kelsie is joined in the front row by her parents, Dave and Lori Byus. Standing in back, from left, are PPHS softball assistant coaches Brian King and Rick Roberts, PPHS head softball coach James Higginbotham and PPHS athletic director Kent Price. POINT PLEASANT, W.Va. — Another feather in the softball program’s cap. For the third time in six months, the Point Pleasant softball team has a student-athlete headed on to the collegiate level after senior Kelsie Byus signed a letter of intent with West Virginia State University on Tuesday, Nov. 16, in the PPJSHS library. Byus — a soon-to-be four-year starter for the Lady Knights — has primarily played third base during her prep career, and her offensive numbers have increased in each of her three seasons with the program. Byus joins recent graduates Cammy Hesson and Megan Hammond — a pair of University of Rio Grande signees — in moving on to the next level, and the future Yellow Jacket is excited about what the next four years can become once she arrives in Institute. That is, of course, once she completes her high school career in the Red and Black. Byus has been a major part of a team that has produced 24 wins in each of the last three seasons, as well as helping maintain Point’s current streak of appearing in 12 straight regional tournaments. 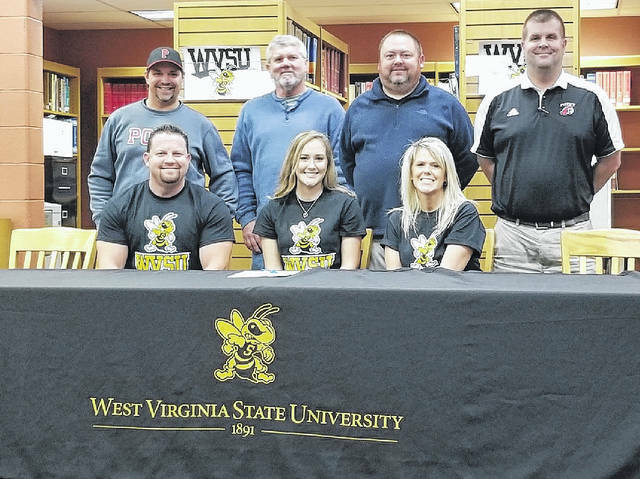 PPHS coach James Higginbotham firmly believes that West Virginia State — a member of the Mountain East Conference at the NCAA Division II level — is not only getting a quality softball recruit, but an even better individual. “Kelsie is a hard worker, she plays year-round and she’s been a big part of our program over the last three years. We have an established program and she continues the tradition of us sending kids on to the collegiate level,” Higginbotham said. “She’s a smart kid and a member of the National Honor Society. She’s everything that you could want in a college student and she has that type of personality that everyone wants to be around, but she also knows how to turn it on when game time rolls around. Byus has produced a .360 average, 26 extra-base hits, three home runs, 43 RBIs and has also scored 49 runs over the last two seasons alone, and was also named to the Class AA all-state team for the first time last spring. Byus was also a freshman in Point’s final season at the Class AAA level. Byus knows that there is a lot of hard work waiting for her over the next few years, but is she excited to take that next step and see just how much better of a softball player she can become. “I feel that I can help the program with my versatility because I can help them fill some spots wherever they might need it, and I’m prepared to do whatever is needed to make the team better,” Byus said. “My biggest concern coming in is the speed of the game. It’s a lot faster than high school, but high school players make this transition all the time. When asked about what drew her to WVSU, outside of athletics, Byus noted that the location was a big plus … as well as the layout of the University. Byus feels that being a member of the Lady Knights’ program has prepared her for this next step. She’s also quick to acknowledge that a lot of people have helped get her to where she is headed. “I feel that Point Pleasant has helped prepare me for the next level because we’ve seen a lot of good triple-A and double-A teams during my time here,” Byus said. “I want to thank all of my coaches and my teammates over the years, as well as my parents for driving me all over creation to play in softball games. Byus — who owns a 4.0 grade-point average — plans to major in Physical Education while at West Virginia State. Kelsie is the daughter of Dave and Lori Byus of Point Pleasant.